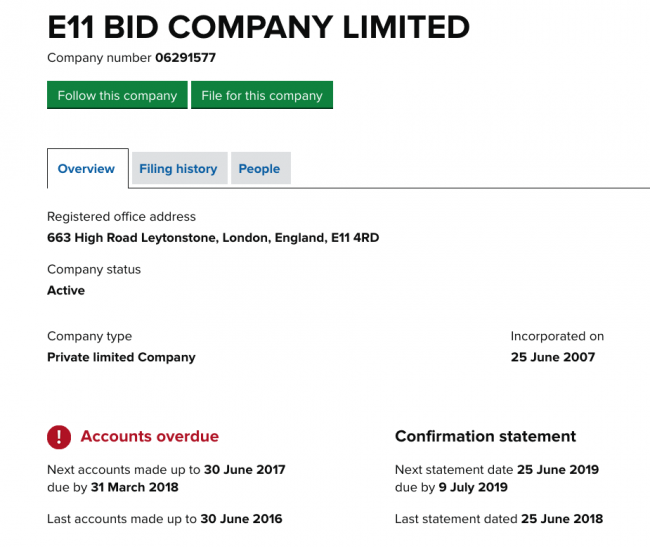 Over the years, this blog has regularly reported on the travails of the E11 BID Co. Ltd. (hereafter BID ONE), a private company that was specially set up in 2007 to run Leytonstone’s Business Improvement District (BID). In some ways, that this has been merited is quite surprising. The financial and operating model that BID ONE initially set out to follow was hardly complicated. As part of the legislation that set up the BID area, LBWF was charged with collecting an annual levy (calculated as a percentage of rateable value) from local traders, and then passing it over to BID ONE. All BID ONE had to do was spend it purposefully, for instance by making the streets cleaner, safer, and in general more welcoming to consumers. It’s also true that LBWF treated BID ONE almost as an affiliate, providing it with copious officer support; a space to use for free; hundreds of thousands of pounds of extra public money, both matching funds for projects and one-off special payments; and the kudos that goes with being an officially recognised member of the borough’s business hierarchy, under the protective guidance of the Waltham Forest Business Board. That at one time or another, two longstanding Leytonstone councillors, Clyde Loakes and Jennifer Gray, actually sat on the BID ONE board amply demonstrates the closeness of the relationship. So in theory, everything should have gone swimmingly. But this being Waltham Forest, of course it didn’t. As is now well documented, BID ONE was chaotically run, failed to pay its taxes, accrued large debts, and suffered adverse County Court Judgements. That’s some history. But regrettably, as the following demonstrates, the controversies subsequently have kept coming. A good place to start is with the little matter of the E11 BID2 Ltd. (hereafter BID TWO). 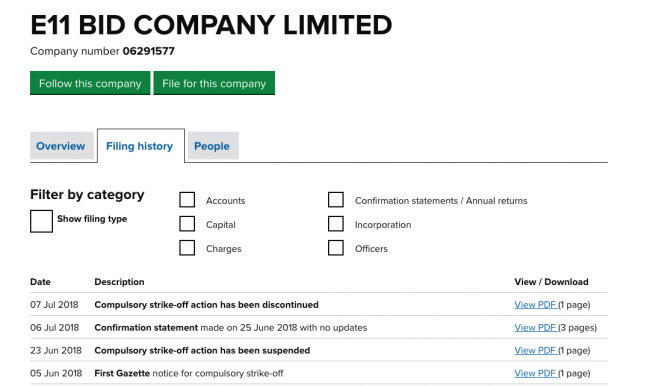 This newcomer was incorporated out of the blue on 30 June 2015, and is a wholly free-standing, independent, legal entity, though with many of the same directors as BID ONE. 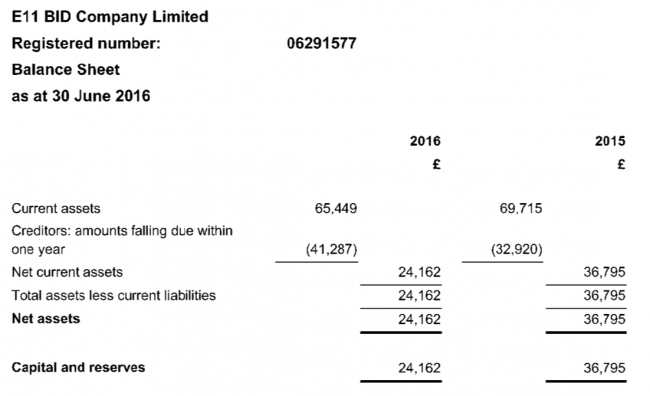 According to LBWF, BID TWO was set up explicitly to take over from BID ONE, with the latter handing over all its assets and liabilities, and then being liquidated. Why BID ONE at this time was suddenly considered lacking and/or unfit for purpose remains unclear. Typically, neither the directors nor LBWF have ever explained. But putting this puzzle to one side, LBWF’s version of events is anyway lacking in credibility. 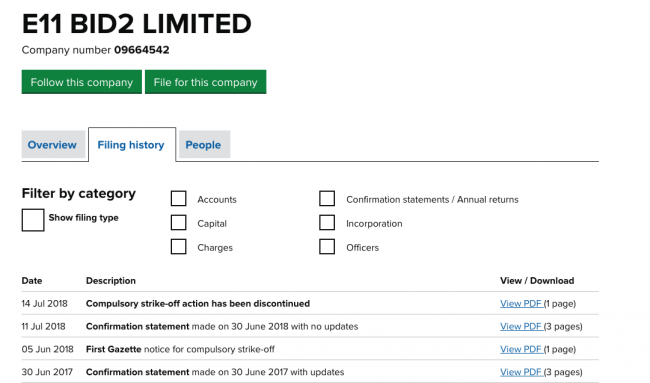 For one thing, three years have now elapsed since BID TWO was incorporated, yet according to Companies House BID ONE remains ‘active’. 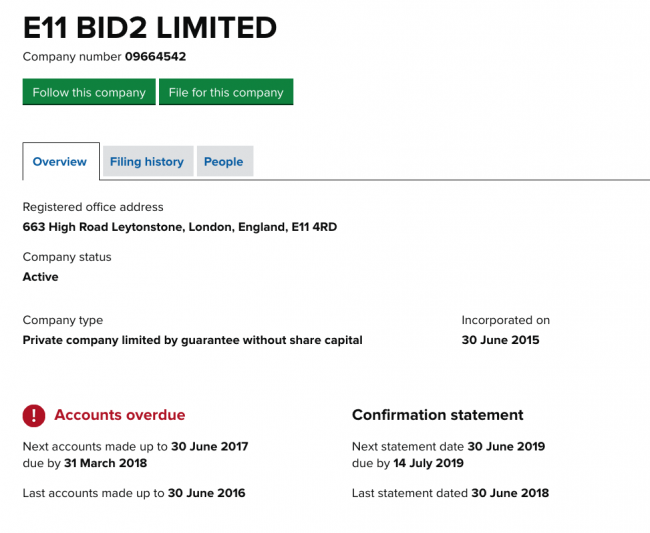 For another, though BID TWO is now also listed as ‘active’, during the year after it was incorporated it remained ‘dormant’ (that is, did not engage in any significant financial transactions), so assets and liabilities were not transferred. Complicating matters further, no-one seems to know which of the two BID Cos is now the BID Co. – the one that is supposed to be receiving annual levy payments from LBWF and spending them to make Leytonstone a better place. Up to and including 2014, BID ONE of course ruled the roost. But subsequently, LBWF has issued bills to traders in the name of BID TWO, and this has produced a series of confusions. 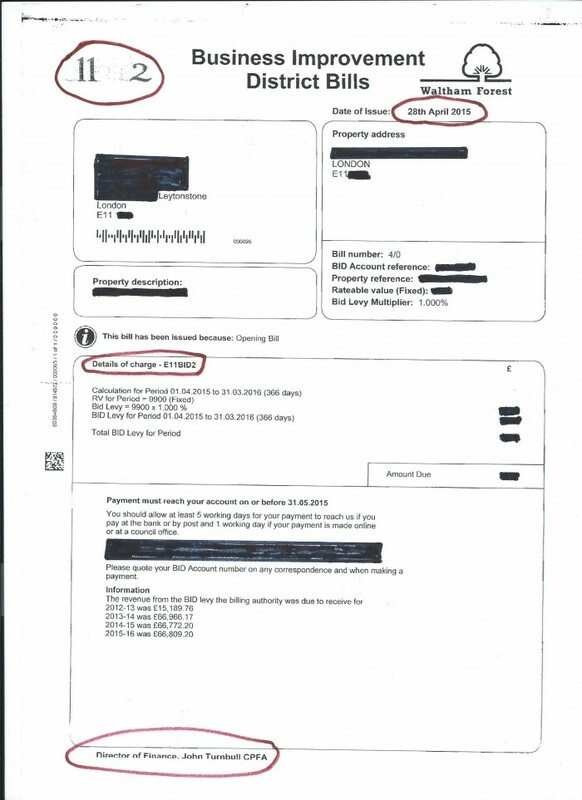 But there is a problem here, because the date of the bill – 28 April 2015 – is actually two months before BID TWO was incorporated. So LBWF was in effect collecting money on behalf of a company that didn’t exist – clearly a nonsense, and one that may yet be judged illegal. Moreover, since, as already has been stated, for the first year of its existence BID TWO was dormant, it could not have been in receipt of transfers from LBWF anyway. So what happened to the levy payments? What they show is that at the end of this particular financial year, BID TWO had no funds at all, while BID ONE’s coffers were full. In other words, LBWF had pulled the wool, claiming that it was collecting on behalf of BID TWO, but in fact passing the money as before to BID ONE. Most readers no doubt will be astonished by these revelations, and ask how such a comedy of errors possibly could have happened. The BID ONE and TWO directors’ record speaks for itself, and it is reasonable to conclude that if a board exists because of other people’s money, and yet fails to submit its accounts on time, in fact is being threatened with compulsory liquidation, then its directors should really take up another hobby, say something appropriately simple like snakes and ladders. As to LBWF, it has repeatedly played the card marked ‘nothing to do with us guv’, and that really isn’t good enough. The E11 BID area and the E11 BID Cos exist only because of substantial council investment, both human and financial. That LBWF has simply walked away when adversity comes calling is unforgivable, and gives the lie to the frequently heard refrain that it is ‘on the side of business’. Presumably LBWF now gambles that the E11 BID story will soon fade from memory, its secrets securely buried. Private Eye reports the E11 BID Co.
LBWF, the Local Authority Business Growth Initiative programmes, and the Waltham Forest Business Board, E11 Bid Co., and North London Ltd.